Transform a section of your garden wall into a stunning focal point with this Ancient Graffiti Flamed Copper Colored Raised Frogs Wall Disc. Two charming frog figures seem to float atop this metal disc, while a bevy of slightly arched lines beneath them evokes ripples in water. The copper and tan tones on the lines and frogs contrast the dark brown of the disc, while enhancing the hues within your garden. A concave shape on the disc creates striking depth between it and the frog accent, and the metal construction of the item remains durable for many seasons. A hanger on the back of the unit makes it simple to place against a wall, while its robust materials and significant size are great for use in the home or outdoors. 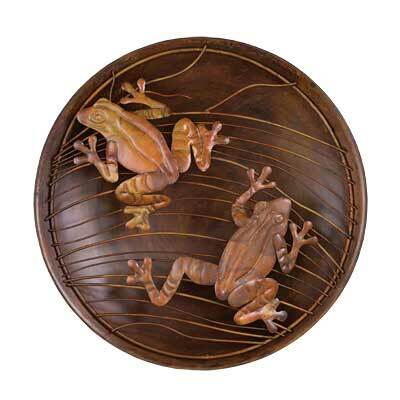 Create a relaxing, wetland motif in your backyard with help from this Flamed Copper Colored Raised Frogs Wall Disc.